ST. LOUIS, March 8, 2017 /PRNewswire/ -- What would you do if you had one more healthy year with your cat? Purina Pro Plan, a leader in pet nutrition, wants to help pet owners find out. The brand has been researching aging in pets for more than a decade to better understand how nutrition can help pets live long and healthy lives. Backed by a pioneering nine-year study, the nutrient blend, found in the new Purina Pro Plan PRIME PLUS Adult 7+, was shown to improve and extend the life of cats seven and older. Findings were based on cats exclusively fed a complete diet with the proprietary blend vs. cats fed the complete and balanced diet alone. PRIME PLUS Adult 7+ is another life-changing innovation in the Pro Plan healthy aging product portfolio, alongside the breakthrough BRIGHT MIND Adult 7+ formulas that support brain health in senior dogs. To help introduce PRIME PLUS Adult 7+ and educate pet owners about the importance of healthy aging in their pets and the role nutrition can play, Purina Pro Plan is partnering with pet aging expert and co-founder of the University of Washington's Dog Aging Project, Matt Kaeberlein, Ph.D. Dr. Kaeberlein's groundbreaking research has led to a deeper understanding of the mechanism of aging in pets, and how science and preventative care can be used to intervene in the aging process. "The discussion around healthy aging in pets is often focused on extending lifespan, rather than how to improve the length of time that a pet is living in good health," said Dr. Matt Kaeberlein, Professor of Pathology at the University of Washington. "I'm excited to partner with Pro Plan to help empower dog and cat owners to think differently about their pet's nutritional needs as they age and make proactive choices to help them live long, healthy lives." Cats begin to experience changes in their bodies around age seven. These changes can affect different aspects of their health such as the immune and digestive systems, body weight and skin condition. In a nine-year Purina study, cats exclusively fed a complete daily diet containing a proprietary blend of nutrients from age 7 on lived longer versus cats fed the complete diet alone. 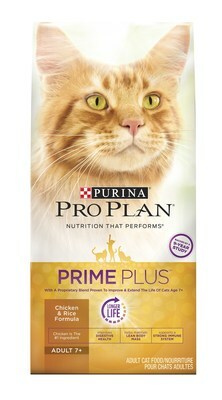 This proprietary blend is available in new Purina Pro Plan PRIME PLUS Adult 7+ formulas. PRIME PLUS Adult 7+ contains a proprietary blend of antioxidants, prebiotic fiber, omega-3 fatty acids and omega-6 fatty acids. This formula also contains key nutrients that support a healthy weight, a strong, healthy immune system, improved microflora for a balanced digestive system and healthy skin. "The results from the feline aging study were remarkable," said Robert Miller, Director of Marketing at Purina Pro Plan. "The blend of nutrients in PRIME PLUS Adult 7+ can positively impact feline health and longevity, and that's something every pet owner can relate to." PRIME PLUS Adult 7+ joins BRIGHT MIND formulas as the newest life-changing innovation in the Pro Plan product line-up. In 2015, Purina Pro Plan introduced its breakthrough innovation, BRIGHT MIND Adult 7+, which contains enhanced botanical oils shown to promote alertness and mental sharpness in dogs seven and older with visible results within 30 days. In 2016, Purina Pro Plan introduced BRIGHT MIND Adult formulas that feature a proprietary blend of brain-supporting nutrients that support cognitive health in adult dogs. Purina Pro Plan PRIME PLUS Adult 7+ is available in Chicken & Rice dry formula and four wet options including: Salmon & Tuna Entrée Classic, Ocean Whitefish & Salmon Entrée, Turkey & Giblets Entrée and Chicken & Beef Entrée Classic. PRIME PLUS Adult 7+ is available now at pet specialty retailers nationwide.